Fantastic place to stay in Budapest! Close to the sights in the day, Close to the party at night! Amazing staff, all friendly, all helpful and most important they all party! Visit!! Visit!! Visit!! Celebrated my 21st bday at Retox last weekend and had a KILLER time. I have been traveling all over Europe for over 4 months and there has not been a hostel more welcoming and fun than Retox! The staff was extremely helpful booking fun activities throughout the weekend, and hosted incredibly fun events during the nights. They also treated every visitor like family and truly made this birthday a weekend to never forget (and barely remember). Thanks again fellas and see you guys this summer! When you first walk into retox you think it’s been hit by a hurricane, this is an elaborate form of camouflage designed to scare away those who don’t belong there. Retox is one of the most amazing places I have ever been, you can go completely crazy, party like an animal and feel completely safe the entire time. The people you meet there will be some of the best people you’ll ever know. Staff go out of their way to make your stay amazing! Special shout out to Syz and Will for being top blokes! Best hostel I’ve Ever stayed at. I was a bit nervous at first (party hostel)but the staff were so friendly and easy to talk, I felt so welcomed. The rooms and washrooms are clean and well set up. Oh, the partying aspect is amazing. There are events every night and they are beyond what I expected - so fun, so entertaining, well planned, just crazy. Everyone is there for a good time. Everyone is looking after each other and the staff are there to party and help out if need be. Best hostel by far. “You will never be this free again” I think it’s place you will never be fell left alone, when i reached i was not sure about it but when i met the people, the staff members especially kevin and gerek you guys are amazing. 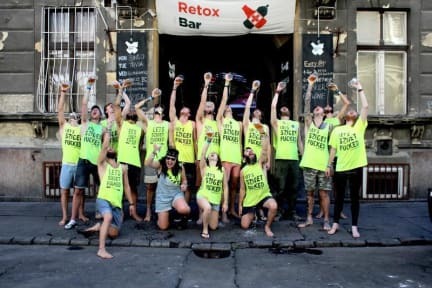 I felt that i was the part of them and that’s what retox is known for.... they are very clear with the rules and always take care about the safety of their guests and just because of retox i felt in love with Budapest. Thank you Retox to make my trip memorable. Great place to stay. Very convenient location to get around the town. Staff and other guests were friendly. Locks available to purchase and towels given at arrival. Would stay again if coming out with group of friends. If you want to party and meet new friends this is the right place! Retox was an absolute blast and made my trip to Budapest so much fun. The staff are so friendly and can't do enough to make you feel comfortable. They organise different events every night so there's something for everyone. The facilities were clean for a party hostel and the vibe was really cool. Will definitely go back when visiting Budapest! I understand this is a party hostel but that doesn't mean it has to be as dirty as it was. With that said, the staff is pretty helpful and the atmosphere was good as well.